This year Wanita took charge of coordinating the event. The meal consisted of ham, mashed potatoes, gravy, corn and salad, as well as pumpkin, apple and peach pies served with ice cream. I was assigned a simple job of helping with a tossed salad. Supper was followed by singing, Bingo, and an inspirational story. As far as inspiration goes, I always find how Amish remember the weaker members of their communities – the aged, ill, widowed – inspiring. Read Gloria’s column in full here, including her recipe for Sweet and Sour Baked Ham. In previous Thanksgiving posts, Don Burke gave us an outsider’s look at Thanksgiving in one Amish community. Short version: the place was pretty quiet, though two congregations chose to have church service on Thanksgiving Day. See the photos and post here. More than any other, this holiday is about good food, and one Pinecraft institution – Yoder’s, an Amish-style restaurant in the Florida Plain community – makes thousands of Thanksgiving pies each year. A Happy Thanksgiving to all Amish America readers. I wish you full dinner plates and time well spent with loved ones. I loved this article. I would like to participate in the 2019 Thanksgiving dinner. Gloria Yoder is an Amish house-wife in rural Illinois. She is the third writer of The Amish Cook column since its inception in 1991. Yoder can be reached by writing: The Amish Cook, P.O. Box 157, Middletown, Ohio 45042. 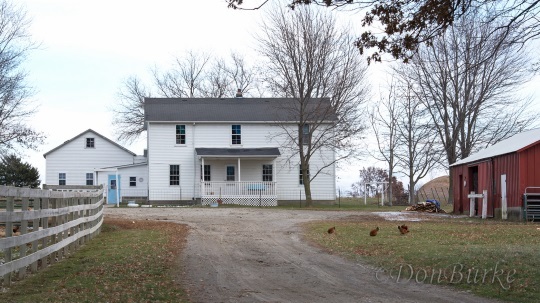 What a tremendous idea – a Thanksgiving dinner for widows, both Amish and English. I’m going to mention to my good Amish friends up in Wisconsin the idea of bringing together, mainly older women so they can share the same – sometimes a traumatic phenomenon – situation and get to know how the other half lives. My wife and I know several Amish widows and English widows, and I’d be willing to bet that both groups will think it’s a great idea. My wife will volunteer to help cook and serve while I will be happy to contribute food…and lots of it. Nice idea, Ken – would love to hear how that goes. I think it is a great idea for widow ladies. But, I am also thinking that there are widowed men out there. They might also like a hot cooked meal by someone besides themselves. Just an idea and thought. Good thought Andy. I second this idea. I am with Amish friends right now and will ask if they have ever heard of something like that. Maybe Gloria’s community does something like that already or would be inspired to.